The "ECO" warning lamp comes on in the instrument panel and the engine automatically goes into standby, with a 6-speed electronic gear control gearbox and at speeds below 4 mph (6 km/h), press the brake pedal or put the gear lever in position N .
In some circumstances, STOP mode may not be available; the "ECO" warning lamp fl ashes for few seconds, then goes off. 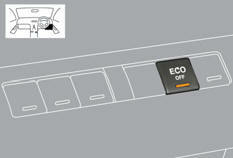 You can deactivate the system at any time by pressing the "ECO OFF" button; the warning lamp in the button comes on.